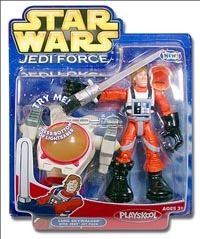 Description Of Item: Grab your lightsaber and fire up the engines in your starfighter! It's time to blast off to adventures in a galaxy far, far away! The coolest Star Wars heroes and villains are ready for battle in the unique Star Wars Galactic Heroes styling from the Jedi Force collection.